It was fantastic to be back at the old Spode factory for some ‘site specific’ or ‘found space’ drama. In Hot Lane, Claybody Theatre and English and Creative Writing Honorary Doctor, Deborah McAndrew, develop many of the characters we met in last year’s Dirty Laundry. The play is billed as ‘passion and betrayal in the six towns’ and it traces how the mundane lives of an industrial community contain as much drama as you find anywhere. Set in the 1950s, the drama explores how the war disrupted moral codes and how the intervening years have introduced technological innovation, but very little social progress for women. The local colour and a palpable sense of the time are created by dance hall scenes brought vividly to life by community dancers. The simple design moves us seamlessly between the domestic spaces of the pottery owner and the homes of ordinary pottery workers. Angela Bain superbly reprises her role as community matriarch, Frances from Dirty Laundry, as does Philip Wright as Pottery owner, Richard Wareham, which is not to diminish the excellent performances of the whole cast. The Potteries accent is hard to master unless you are born to it, but the whole cast transport the audience to 1950s Burslem with ease (Philip Wright, some-time ago, told me that he’d learned the accent from watching videos of Port Vale’s Tom Pop – now there’s a Stoke accent). The students who accompanied us had a great time and were taken with the atmosphere of live theatre. Early next year, we will be visiting the New Vic for Broadsides’, Much Ado.. (directed by Claybody’s Conrad Nelson). Deborah tells me that she is considering a prequel: this is box-setting at a very gentle pace! A group of 1st and 2nd year students set off at way-too-early O’clock on Saturday morning and reached our hotel near the Gare du Nord in the early afternoon, leaving time for a trip to Montparnasse and the Sacre Coeur, followed by dinner in a properly Parisian bistro. Sunday morning we were at the Musee d’Orsay to see the great impressionist and post-impressionist works of Monet, Manet, Gustave Caillebotte (it’s important to have a bottle of wine when doing a spot of sanding) and Van Gogh (amongst many others). In the afternoon we found ourselves underground with the Paris dead in the catacombs (we suspect that some of the inhabitants hadn’t survived the queue outside) and in the evening saw Paris at night from the Eiffel Tower. Monday morning we visited Notre Dame and the famous hang-out of Paris’s modernist literati (Joyce, Hemingway and Stein amongst them), the Shakespeare and Co bookshop (with Aggie the book-loving cat). All this in 48 hours! Time for a sit down. In Act 3, Scene 2 of Hamlet, the prince asks a troupe of players to use their performance ‘to hold as ’twere the mirror up to nature’. He wants to show his adulterous mother and murdering uncle the truth of what they have done in killing his father and taking the throne of Denmark. Drama, then, should show us the world, so it is appropriate that the RSC production of the play, currently touring, should reflect the realities of the global culture and multi-cultural society in which it is being performed. The cast are mostly black actors and Elsinore transported to an African country (still, conveniently, called Denmark) where the action is accompanied with African drumming and singing. Paapa Essiedu was sublime as Hamlet, while Ewart James Walters excellent as both the ghostly king and a reggae gravedigger (this felt familiar. Did I see it, perhaps, in the Manchester Royal Exchange production recently?). Buom Tihngang as Laertes was at his best as the bereaved brother and son, while Mimi Ndiweni’s sung lament to her thwarted love for Hamlet’s was mesmerising. The Lowry is a big space, and the atmospheric soundtrack which accompanied the action created unnecessary competition for the actors to be heard in some of the more subdued moments. If the RSC are passing your way, I suggest that you take the chance to see a great production; one that may be talked about in the future as a defining take on Hamlet. HOME Manchester, Lyric Hammersmith and 59 Productions are staging an adaptation of Paul Auster’s novella, City of Glass. City of Glass is the first of 3 metaphysical or postmodern detective stories collected in The New York Trilogy, which is Auster’s best known novel and the one attracting the most attention from scholars. The production coincides with Auster’s new novel, 4 3 2 1, and his visit to the UK to promote it – he’s been on Radio 4 and Newsnight in recent weeks, and read from his novel at, among other venues, HOME. The metaphysical detective story employs the conventions of the traditional detective mystery – a crime, clues, investigation, a detective, a suspect, a femme fatale – but along the way the detective finds himself contemplating complex and foundational philosophical ideas. In City of Glass, the detective figure finds himself investigating language, identity, writing, narrative and literary form. I use the term detective figure here because Daniel Quinn is a detective writer who takes a case meant for the Paul Auster Detective Agency. Some 50 members of the public attended the Dark in the Day Book Launch at City Central Library on February 7th. The book publishes 8 Staffordshire University creative writing students (6 undergraduates, 2 postgraduates) alongside established writers in the field of ‘weird fiction.’ The project came about when guest lecturer, Storm Constantine (author and publisher) suggested to creative writing lecturer, Paul Houghton, they might work on an anthology together with the students. The format for the evening was six contributors reading six-minute extracts. Before that, co-editor of the book, Paul Houghton introduced the event which began with a particularly luscious and surreal poem by Dr Lisa Mansell, ‘Angels of Anarchy’, inspired by the work of Leonora Carrington. The first story excerpt was by final year undergraduate, Jack Fabian, who read from his eerie story, ‘A New Womann’ about an artist inspired by a disfigured woman. Next up was Sian Davies, another final year undergraduate, with an equally chilling tale, ‘Post Partum’, about a new mother who believes her baby is not her own. She was followed by PhD creative writing student, Paula Wakefield, who read from her story, ‘In Touch’, a psychological zoom-lens analysis of an intense relationship. After a break for wine-bipping, bookselling and chat, lecturer Paul Houghton read an extract from ‘The Strange Case of Quentin Wilde,’ a black comedy which details a dummy’s first night out. Novelist and publisher, Storm Constantine read from ‘The Secret Gallery’, a luscious, dream-like story set in the mysterious Galleria Buiocuore. The surreal tone was continued by guest author Rosie Garland, who read from her dramatic and equally poetic story, ‘An End to Empire’ which has become even more poignant in the light of recent political events in the U.S. Rosie also gave an impassioned speech about the inspiration and importance of public libraries. After more wine, book sales and chat, a happy audience filed out in an orderly manner. It was great to see so many people there, even a few former students as well as library users and curious people. Many thanks to Emma and all the lovely staff at City Central Library for all their work and support. Our English and Creative writing group had the fantastic opportunity to go on a Shakespearian adventure to Stratford-Upon-Avon. On Friday 20th January, we set off at 3pm to the town of Alveston where our youth hostel was situated. When we arrived at Hemmingford House we were allocated our dorm rooms. We only had time for a quick freshen up as our departure to Stratford was imminent. We took a short journey into town and managed to locate quickly a nice local pub for some refreshments. After feeling restored we headed on down to the Royal Shakespeare Company to watch The Tempest. We were situated down the right-hand side of the stage and the view was particularly good. I personally had no previous knowledge of the play, so I was expecting to struggle with the plot and dialogue. However, I was proven wrong. The actors and actresses performed The Tempest clearly and dramatically. They made full use of the staging; hidden plinths arising from the stage floor and wooden trees that could even resemble a ship depending on the scene. Their use of technology should not be overlooked either as the sound and lighting effects produced larger characters and brought beasts to life. The play itself is set on a remote island where a sorcerer and his daughter have been stranded for 12 years. He then uses his magic to conjure a storm to shipwreck the men responsible for his banishment. Romance, comedy, and tragedy are all added along the way of the sorcerer’s journey back home. We all thoroughly enjoyed the play. As a first timer to the Royal Shakespeare Company, I can assure you I will be going again. After some post theatre drinks, we retreated to our dorm rooms. The following day we headed back into Stratford where we split up into groups to do some sightseeing. Amy, Becky, and myself decided to go and see Anne Hathaway’s house which was a reasonable walk out of town. When we got there, we walked through the gardens to the cottage where she lived with William Shakespeare. On arrival, there was a female tour guide who was telling us that William Shakespeare would often come to the cottage and write between plays. He would often leave his wife and children behind when he went to London due to the poor living conditions in the overpopulated city. She also told us the average life expectancy in London at that time would be around 20-30 years old, whereas in Stratford it would be much longer of around 40-50 years old. She went on to say that this was because of the clean air in the countryside and that they were living from their own land. After a brief question and answer session we explored the rest of the house. A group us from our English and Creative Writing group attended the New Vic Theatre on Monday 6th February to watch Cyrano de Bergerac. This is a play adapted by Deborah McAndrew and directed/composed by her husband Conrad Nelson. Deborah was instantly recognisable to us all as a regular in Coronation Street in the 90’s, as she played a character called Angie Freeman. 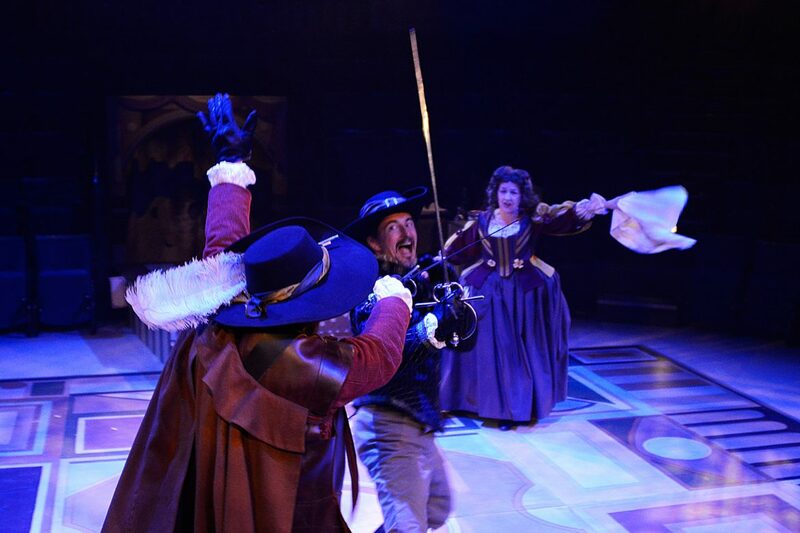 Cyrano was performed by the award winning Northern Broadsides in a round theatre. Different props and lighting were used to set the scene for a variety of different places in Paris: a playhouse, a bakery, outside Roxanne’s window, the frontline and a nunnery. As it turned out, we ended up a fairly small, but perfectly formed little throng of 15 +, a cross-section of really nice people from all study-levels, with some joining us along the way, and also leaving at various stages of the programme, for one urgent reason or another. (One student had actually gone to the length of driving up with her lil’ toddler son to meet us at Lime Street station; she had to leave half way through, but – as we heard from her the next day – spend more than 5 hours on the motorway on her way back: so not lucky!). A sizable part of the group made use of the opportunity to check out the watering holes and eateries in up-town Hope Street area, after the bugle had been sounded that ended the official part of our venture. One of these night birds, at the ‘Career’s Fest’ next day (a man, who shall remain nameless), had the deep bass-baritonal timbre of voice that normally follows a bout of alcoholic abandon…. At the station we were also joined by Greg, one of our Level 5 ‘mature’ students, dyed-in-the wool scouser and guide extra-ordinaire from whose expert knowledge we beneffitted all day long. He led the way, and also led by mature example as some of us frequented the more insalubrious establishments of town, in between watching the High-Art display in the two Galleries, and then later into the night…. The next station was the newly reconstructed and modernised City Library, right next to the Walker Gallery. Greg pointed it out to us and suggested we go in. We took a look at the old rotund Reading Room, reconstructed and absolutely glorious, not unlike the old Reading Room of the British Library in London, then housed in the British Museum. We took the above group picture on the Viewing Platform on the top floor of the modern new part of the library, whose interior compares very favourably with the new Birmingham Library, but here, of course, the modernist interior design is very well hidden behind the early C19 facade behind which it is inserted, whereas part of the splendour of the Birmingham Library is also in its multi-culturally inspired exterior design: Orienalising (? ), filigree…. Greg then led the way through town towards the Albert Docks. We got a good whiff of the Mersey sea air (with the weather wildly oscillating between misty, rainy gloom and bursts of sudden sunshine). The tide was half in, and the water over to the Birkenhead shore was like a grey mirrror, reflecting clouds and the high buildings on the other side. Some of us went for a liquid pub lunch, others for more solid food in the Gallery’s café. Tate Liverpool had provided us with a living guide, who, for a fee (Mel, extremely kindly, forked out on all our behalf!) talked us through Tracy Emin’s Unmade Bed, as an example of a ‘Self Portrait of the Artist as a Troubled Young Woman’ (very convincing! ), and tried to draw parallels (perhaps not so convincing!) with the 25 or so William Blake etchings, drawings and paintings which Emin had chosen as context for her own artistic bed-statement. The Gallery has been following through for some time with their laudable project of connecting conceptually seemingly very different art works by exhibting them side-by-side.. With Blake and Emin (Mel and I talked about it afterwards) we were not so sure whether the connection worked, even though the guide, John Hughes, did his best to draw out the links. For example, the contrast of the soft toys by the side of Emin’s bed with the depressing adult chaos of the bed he connected with the contrast of Innocence and Experience in Blake’s poetry and painting. (He also interspersed his substantial talk with amusing limericks of his own making characterising ‘the essence’ of various artists: Pollock, Dali, Emin, Blake, etc..) In any case: both the Bed and the Blake were well worth looking at. All in all, a good day out with very nice things to do, in the company of very nice people (on an otherwise depressing day, with Fascism looming in the Anglo-American world). Paul Beatty has won this year’s Man Booker Prize for The Sellout. His work satirises the hypocrisy and contradictions of racial politics in the US, drawing attention to the effects of economic and social segregation on the black communities of America. This most recent novel tells the story of an African-American visionary who reinstates slavery and segregation in his LA suburb to put it back on the map, and the subsequent Supreme Court trial – ‘Me v the United States of America’. Beatty’s second novel, Tuff, explores the world of NYC gangs and the mentors who promise to save black men from a life of crime through capitalism. White Boy Shuffle, his first novel, explores the history of black leadership through a black poet with a European name, Gunnar Kaufman, who is moved by his mother from Santa Monica to the ‘hood in search of authentic black experience. Gunnar witnesses police oppression (the LAPD are ‘dressed to oppress’), riots (a ‘psychological placebo’, a ‘vitriolic stimulant’ and ‘Carnival, ghetto style’) and gang culture (Psycho Loco and his gang, the Gun Toting Hooligans, are laugh out loud parodies). Throughout his work, Beatty focuses on the roles of parents in shaping his young black and male protagonists, and the transmission of the legacies of slavery and segregation from one generation to the next. On Radio 4 this morning, Beatty said his work contemplates ‘how we measure progress’. This award should propel Beatty’s earlier novels back into print; come on Random House, this stuff deserves a wider readership.